February 2007 – The Newsletter of the Association of Anaesthetists of Great Britain and Ireland, London. 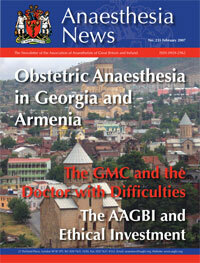 Click HERE to view an article about Kybele on Obstetric Anesthesia in Georgia and Armenia. (Kybele Article is on pages 3-5). Article by Simon Millar.